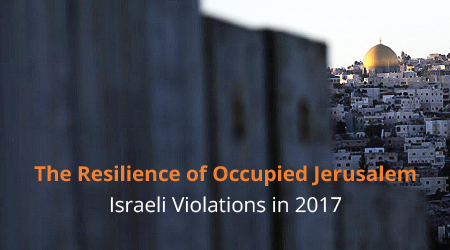 This report provides a detailed narrative of the main policies and practices of the illegal colonial occupation as well as the systematic assaults against the Palestinian people in the occupied City of Jerusalem during 2017. The report also presents an account of the escalating violations and intensifying arbitrary measures exercised by the occupying forces and illegal Israeli settlers, with absolute support from the US administration, against Palestine and its people. Furthermore, the report unveils the major political and illegal practices committed by Israel, the occupying power, which has been acting with impunity, in the absence of accountability under international law and without any deterring intervention. Putting an end to further violations by Israel requires an adoption of practical and concrete positions by the international community in order to hold Israel accountable pursuant to the provisions and principles of international legitimacy.